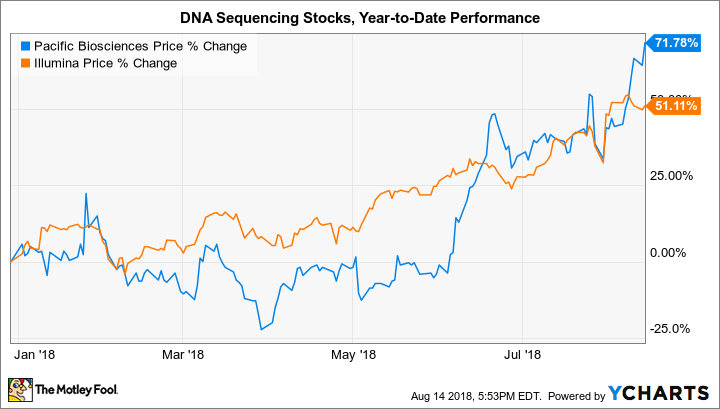 Will This Biotech Stock Join the $1,000 Human Genome Club in Early 2019? Pacific Biosciences thinks platform upgrades will cut its Sequel machines' DNA sequencing costs 92% by 2019, opening a $2.5 billion market opportunity in 2022. How many genes are in a human genome? Good question. Turns out we still don't know the answer, as we haven't fully sequenced the human genome to completion. Researchers got close enough to prove it could be done, estimating the number at around 20,000 genes, and moved on to focus on lowering the cost of DNA sequencing technologies so that humanity could benefit from the medical wonders hidden in our genetic code. Any reductions to the cost of investigating our DNA will be hugely significant for investors. Ever since Illumina (NASDAQ:ILMN) commercialized a DNA sequencing platform capable of delivering human genomes for $1,000 a pop (albeit with some squinting), there's been a nearly insatiable craving for genomic data. The total next-generation sequencing (NGS) market was valued at $3.5 billion in 2017, and it's expected to grow to more than $8 billion by 2022 -- and even that could be a gross underestimation. While the $1,000 benchmark has been well out of reach for other companies so far, Pacific Biosciences of California (NASDAQ:PACB) expects to join the coveted club in early 2019. Could this be the make or break moment investors have been waiting for? Illumina and Pacific Biosciences couldn't be more different. The former is a $48 billion sequencing titan, whereas the latter weighs in at a comparatively tiny $597 million. The former delivered $830 million in revenue in the second-quarter of 2018, converting over 25% of that to net income and free cash flow. The latter delivered just $19 million in revenue in its most recent quarter, and reported a net loss of $24 million. So why is Pacific Biosciences struggling to cash in on the multi-billion bounty of DNA sequencing? The single biggest factor is sequencing costs, which are almost entirely dictated by technology. Illumina has gone all-in on a specific method for reading genetic code that relies on chopping up a genome into tiny fragments and reading them piece by piece ("short-read"). Its smaller competitor relies on a method that reads genomes in very large fragments ("long-read"). Both methods have advantages and disadvantages, so researchers often combine the two for the most critical experiments. However, long-read tech is mostly relegated to a niche role due to its cost. After the most recent update to Pacific Biosciences' Sequel System in the first quarter of 2018, it will still cost $12,000 to sequence a human genome for medical purposes on the platform -- and that only includes consumables (enzymes, reagents, etc.) for conducting a run, not the depreciated cost of the machine itself. But big changes are coming to the Sequel System, and soon. An update in the second half of 2018 will cut the consumable cost 42%, enabling a $7,000 human genome reading. The next update in early 2019 will up the bar further still. By then, Pacific Biosciences expects its prized hardware platform to deliver human genomes for just $1,000 in consumable expenses. That's only slightly higher than an Illumina run on a consumables basis, and would mark a 92% drop in sequencing costs in the span of a year. The company thinks cutting the cost of sequencing on the Sequel will expand its total accessible market opportunity from $660 million last year to $2.5 billion in 2022, including a roughly $1.4 billion opportunity in human biomedical applications (the remainder comprises microbial, plant, and animal sequences). Can the business deliver? Assuming the upgrades enable something close to $1,000 human genomes, it seems reasonable for investors to expect Pacific Biosciences to capture a larger slice of the expanding DNA sequencing market. That's especially true considering long-read tech can sequence parts of a genome that have been off-limits to short-read approaches, one of the reasons that we haven't actually fully sequenced a human genome yet. The explanation gets technical quickly, but has to do with how genomes are chopped up and assembled just prior to being read by a machine. The important takeaway is that the reliance on short-read tech (read: Illumina) means between 4% and 9% of the letters in the human genome have actually never been read. While there has been skepticism in the past about the medical relevance of these gaps, researchers now think these hidden regions could play roles in cancer, autism, and aging, among other ailments. Considering the cost-reducing Sequel updates are enabled in part by making even longer reads than before, Pacific Biosciences is well-positioned to help researchers prowl around these genomic shadows. For similar reasons, long-read tech is better-suited for precise genome engineering applications (like in agricultural and industrial biotech), and is quietly gaining momentum in the buzzwordy field of precision medicine. Reducing sequencing costs 92% should only help to accelerate the use of the company's systems. While this time really could be different for the business, it's worth noting that "accessible market opportunity" is not the same thing as real-world sales. Pacific Biosciences states that it had a total accessible market of $660 million in 2017, but it didn't even top $100 million in revenue for the year. That could make investors roll their eyes at the $2.5 billion market opportunity figure -- after all, capturing an identical percentage would only result in $380 million in annual revenue five years from now. Furthermore, the Sequel system isn't the only game in town when it comes to long-read sequencing. A $2 billion start-up by the name of Oxford Nanopore is optimizing its own flavor of long-read tech that can be used in much smaller form factors, including handheld DNA sequencers. According to the company, its soon-to-be-released premium system could deliver human genomes for just $800 apiece. Investors might be overlooking it today, but by 2022 it could steal market share from both Illumina and Pacific Biosciences. Although reducing costs 92% sounds like a big number (and it is), there aren't any technical hurdles standing in the way of Pacific Biosciences achieving a $1,000 human genome with the Sequel system. While that should expand the reach and customer base for the DNA sequencing platform and push the business closer to profitability, hitting the milestone doesn't necessarily guarantee long-term success in this quickly changing industry. Investors will need to ensure the company's upgrades deliver on their stated performance specifications, hope that leads to more instrument and consumables revenue, and keep an eye on other long-read sequencing companies similarly looking to disrupt Illumina. Is This the Real Reason Illumina Acquired Pacific Biosciences?